I have a more standard review of Wes Anderson's new, spectacular film Moonrise Kingdom up at Shadowlocked, but I wanted to use this space to address some of the film's more formal and auteurist concerns, because dammit that's my luxury. Coming out of the initial screenings both here in Los Angeles and stretching all the way to Cannes, the main thread of conversation, particularly from its detractors, went, "well, that was a Wes Anderson film all right," which is sort of like when I saw Indiana Jones and the Kingdom of the Crystal Skull and my roommate noted, "that was definitely an Indiana Jones movie." There are implications in each, but the former suggests a stasis, and indeed, there was a lot of talk about how Wes Anderson hasn't changed much as an artist, an accusation I find baffling, but okay, let's start from there. Certainly you can trace some aesthetic concerns from Bottle Rocket (1996) all the way to Moonrise Kingdom, but they're a lot less pervasive in the former and much more developed in the latter. Moonrise Kingdom, despite lacking the ambition of The Royal Tenenbaums (2001) or certainly The Life Aquatic (2004), is Anderson's most formally accomplished work. For once, no shot seems left to chance beyond the completely unpredictable elements of live action photography, and his mise-en-scene is, frequently, unbelievably complex, far too much to take in during a single viewing (I'll be seeing the film again this weekend). 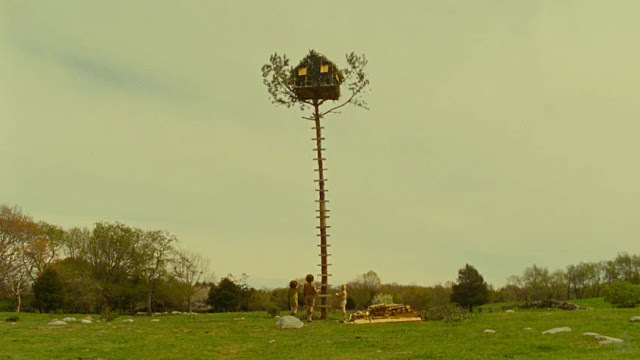 Moonrise Kingdom also offers a renewed focus on exaggerated comedic visuals, which you can find in his earlier work certainly (the twins and Magnus in Rushmore (1998), for example) but which sort of petered out by the time of The Darjeeling Limited (2007). Here, he ends up in almost the almost surreal territory he tread in Fantastic Mr. Fox (2009), visually contrasting Sam (Jared Gilman) against his troop or fellow orphans to instantly demonstrate just how out-of-place he is. His whole conception of the Khaki Scouts is quintessential Anderson, capitalizing on American cultural heritage to create something at once laughable and comfortable. 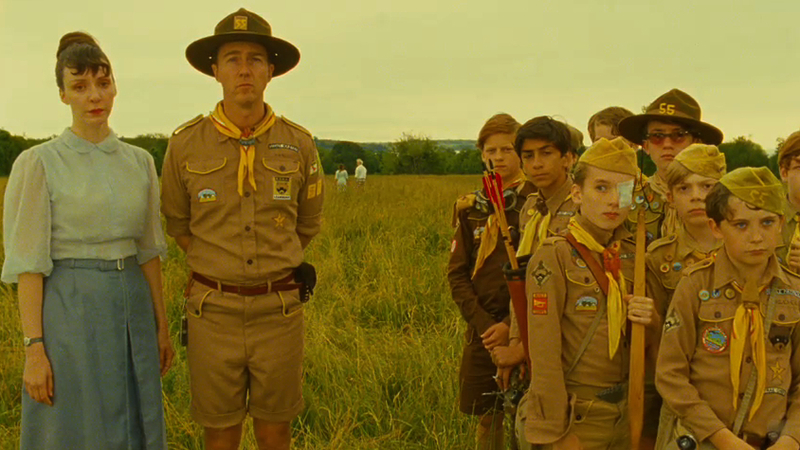 That Ed Norton makes the perfect scout leader, the very image of a boy in a man's body, is but icing on the cake. Looking at those frames above, the Anderson devotee will also notice another major shift, away from the 2.35 anamorphic widescreen frames of his middle period (Rushmore through Darjeeling) that defined his aesthetic as much as anything else, and into the boxier 1.85:1 frame of Bottle Rocket and Fantastic Mr. Fox. It makes for an interesting transition, and some of his frames do feel a little crowded as a result. In that shot of the scouts, for instances, one sense more activity to the right of the screen that a wider frame could have accommodated, but others are perfectly calibrated - the opening sequence in particular, which sets the aesthetic stage for much of what is to come, is dazzling. The climax is one of the most simple, perfectly conceived and executed pieces of cinema we'll be lucky to get all year. And don't worry, Anderson hasn't forgotten about the characters. I never bought the line that he ever did, and in particular, I found The Darjeeling Limited to be his most intensely character-focused effort. Redemption is a major thread in Anderson's work - it's part of what makes him a classicist - but the troubles of the brothers in Darjeeling were so much less tangible than the distant fathers of Tenenbaums or Life Aquatic, the criminal activities in Fantastic Mr. Fox (2009), or Max Fischer's pigheadedness in Rushmore, so Anderson's typically ecstatic outpouring of communion at the end of Darjeeling felt forced, and destined to be short-lived. Moonrise Kingdom is nothing if not tangible - those visual contrasts that are immediately established ensure a line in the sand that Sam and Suzy will never truly be able to cross. Anderson has always been fascinated with the thin line separating childhood from adulthood, and he continues that exploration by similar means here - the kids all act a little older than they should, and the adults much younger. Sam and Suzy's escape is the very definition of adulthood, the final leaving of the nest to make a life for oneself, usually with the hope of starting a family. Their initial explorations of this freedom are awkward, and Anderson isn't shy about mining the humor, but he's not too snarky to overlook the beauty in their efforts, the earnestness of their intent. Usually when filmmakers look back to childhood, they find a "simpler time," but if anything, Sam and Suzy's lives are infinitely more complex. Suzy's parents (played beautifully by Bill Murray and Frances McDormand) may be having marital troubles, but they know each other well enough to know the steps. By contrast, Suzy is at a loss for why she found a book in her house instructing her parents on how to deal with an out-of-control child. What's a twelve-year-old girl to make of that? Moonrise Kingdom may look on the surface to be a nostalgia trip, but it is so much about that initial peek into the world as it really is, and how terrifying that can be. I want so much to talk more about it, but I want so much more for everyone to have a chance to discover everything else for themselves. Certainly to be reminded of just how great Bruce Willis can be, and how surprisingly suited he is for a Wes Anderson film. Few can do as much with so little. And after Fantastic Mr. Fox, arguably Anderson's funniest film to date, he doesn't sacrifice laughs here, either. This is a surprisingly plot-driven film, and Anderson uses the pace inherited from that form of storytelling to keep the humor alive. More than anything, I hope doubters and fans alike will be open to how much Anderson has grown as an artist, how much more his initial musings have become defined, and how adept a storyteller he is, compressing a whole world into scarcely more than 90 minutes. It's an astonishing film, simple by design, but so intricately and lovingly designed.